"FL-9" redirects here. For the state road, see Florida State Road 21. 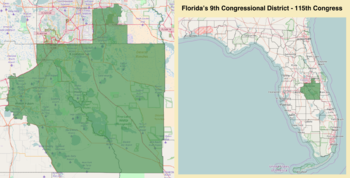 Florida's 9th congressional district is a congressional district in the U.S. state of Florida. It stretches from eastern Orlando south-southeast to Yeehaw Junction. It also includes the cities of Kissimmee and St. Cloud. From 2003 to 2012, it encompassed most of rural eastern Hillsborough County, northern parts of Pinellas County (including Clearwater) and the Gulf coast of Pasco County (including New Port Richey). The redistricting on January 3, 2013, completely reassigned the boundaries of the 9th district to mostly Osceola County with central Orange County plus northeastern Polk County, while the former 9th district became parts of the 10th, 11th, 12th (Pasco County) or the 14th district which split Hillborough County with the 15th and 17th district. The 2013 redistricting also expanded the State of Florida from 25 to 27 districts, adding 2 at Miami-Dade County, Florida. The district is currently represented by Democrat Darren Soto. As of January 2017[update], there are five former members of the U.S. House of Representatives from Florida's 9th congressional district who are currently living at this time. The most recent representative to die was Paul Rogers (served 1967-1973) on October 13, 2008. ^ See whole Florida state map for 2013, with the 9th district covering Osceola County and Orange and Polk County: h9047_35x42L.pdf Congressional Plan: H000C9047. Chapter No. 2012-2, Laws of Florida. www.flsenate.gov. February 16, 2012. ^ See the 2013 boundaries of the 9th district covering Osceola County and northeastern Polk County in the 2013 districts map: H000C9047_map_sw.pdf, for the southwest region of Florida, along the Gulf of Mexico, from Pasco County to Collier County, Florida. Congressional Plan: H000C9047. Chapter No. 2012-2, Laws of Florida. www.flsenate.gov. February 2012. ^ ""Florida Department of State Division of Elections"". This page was last edited on 18 March 2019, at 00:55 (UTC).